This great rotisserie chicken recipe became hugely popular along the East Coast of the United States a few years back. Known as Super Chicken, El Pollo Rico, or Peruvian Chicken, this is a tasty way to make a bird with enough flavor to satisfy most everyone. Combine vinegar, wine, oil, garlic powder, cumin, paprika, black pepper, and salt. Mix well to form a paste. Add lemon juice to cold water. Trim chicken of any excess or loose fat. Wash chicken thoroughly with lemon water. Place chicken in a zip-top bag. Pour spice paste over chicken. Coat chicken completely with mixture rubbing into every surface. Try to get the paste under the skin as much as possible. Seal bag and place chicken in the refrigerator for at least 2 hours. The chicken will have more flavor the longer it marinates in the spice mixture. Do not refrigerate for more than 24 hours. Preheat grill and prepare rotisserie. 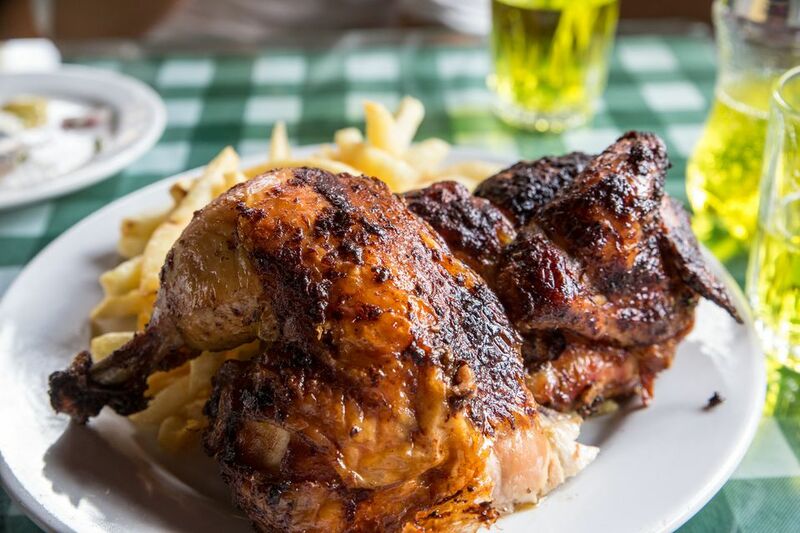 Place the chicken on the rotisserie and on the grill for approximately 1 1/2 hours at a temperature around 300 F (150 C) Test chicken for doneness by the measure the temperature in the thickest part of the thigh. Chicken is done once the thigh meat reaches 175 F (85 C). Remove chicken from grill and place onto a large heat-resistant cutting board. Carefully, remove rotisserie rod and lightly tent the chicken with aluminum foil. Let rest 10 to 12 minutes before carving. This chicken is frequently served with dipping sauce. A simple version of this sauce is made from combining 1/2 cup/120 mL of mayonnaise with 2 tablespoons/30 mL mustard and 2 tablespoons/30 mL lime juice.